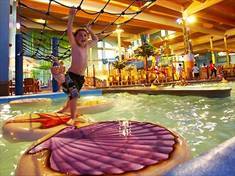 CoCo Key Water Resort in Kansas City bills itself as Missouri’s largest indoor water resort! It features 55,000 square feet of watery diversions including three body/raft slides, an innertube "adventure river" attraction, the Parrot's Perch interactive play island for kids, and a dip-in theater showing movies at certain hours. The Key West-themed resort also offers a cavern pool, indoor and outdoor spas, and a lounge. Day passes are available for non-overnight guests, depending on waterpark capacity.